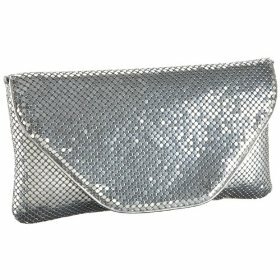 Here we have another metal mesh purse from affordable handbag designer, Prezzo. The mesh on this purse is a lot finer than the chunky styling that we see on the brand's other mesh purse. I personally prefer this more delicate metal pattern, which not only feels great to hold, but looks more sophisticated too. That sophistication is added to by the lack of decoration; the silver and the distinctive shape speak for themselves. OK, so a bargain clutch like the $37 beauty isn't ever going to be of the highest quality. But generally I feel Latico has done well; the color isn't too brassy, and the design is great. It actually is a great deal as it even comes with an optional chain strap, so you get practicality too! The Whiting & Davis Chain Chain Chain clutch, a great alternative to this mesh bag.